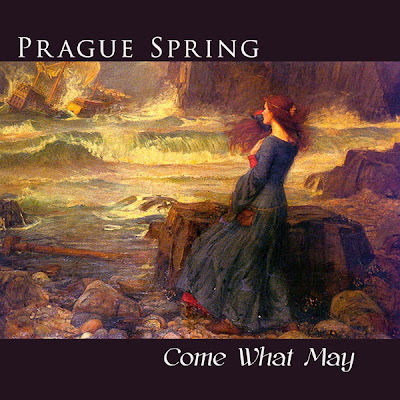 So, it turns out I inadvertently created a new Prague Spring album. The album is called Come What May. I know, I know, the music is all from Hamlet and Macbeth but the artwork is from The Tempest. Bite me. Enjoy it while stoned or about to go to sleep. What happened was I've found myself responsible for the sound on the new version of Mac Rogers' Universal Robots. Because I don't want to compose an entire score while I'm also working on a couple movies, I figured I'd reuse some of this stuff. So I dug up the music I did for my movie Hamlet and for the play version of Macbeth I scored (I also scored a comedic movie version of Macbeth, but this isn't that.) So I have an entire album's worth of material, and I figured I may as well put it together as one. The thing is, the music is by and large unlistenable. It's music designed to be talked over, because it's all (or mostly) underscore. The music misses the middle, or melody. There are a couple exceptions, the Coronation for instance. But the point of the music is to affect the emotion of the audience, not really to be listened to on its own. The entire album is up as mp3's. I'll probably submit it to Pump Audio. In the meantime, it can be perused by directors or whomever for shows and movies. If I could make money with it by someone using it in a score or a commercial, that would of course be awesome. I found a nice free font source at Abstract Fonts. I know, I know, I should have used Trajan throughout. *Yes, the last Prague Spring album was named "Pleasure for the Empire". I was thinking about naming the first Pleasure for the Empire album "Prague Spring". What I really want to do is name an album "Disambiguation" so that one day Wikipedia will have a "Disambiguation disambiguation" page.